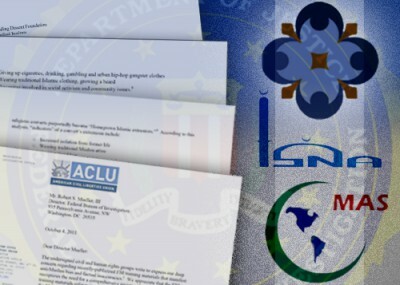 The ACLU letter also principally focused on an FBI Intelligence Assessment document dated May 10, 2006 on homegrown Islamic terrorist radicalization titled, "The Radicalization Process: From Conversion to Jihad," claiming the assessment portrays converts to Islam in America as targets for radicalization who should primarily and mostly be viewed as suspects. Such innocuous behaviors may indicate strong religious beliefs, and each is entirely protected by the First Amendment to the Constitution. Millions of Muslim-Americans may engage in some or all of them on a routine basis. Claiming these behaviors are indicative of a progression toward extremist violence is therefore both factually unsupportable and improper under the law." While the assessment lists the segments identified in the ACLU letter, the context given in the ACLU letter is notably skewed. It indicates the full sum of the FBI assessment focused on those listed "indicators" that, in and of themselves, could well be innocent constitutionally protected activities. The three separate categories are "identification," "indoctrination" and "action." Taken in that more detailed context, these "indicators" are significantly more focused on the pertinent issue of jihadist radicalization. American Mohammad Zaki Amawi who became radicalized and was charged in Ohio with planning to commit violent attacks against Americans overseas, including U.S. troops in Iraq. Amawi became "more radical in his appearance, behavior and expression of his beliefs" after returning from an extended trip to Jordan in 2004, his sentencing memo said. Amawi was convicted in 2008. American Carlos Bledsoe, aka Abdulhakim Mujahid Muhammad, was sentenced to life in prison for the terrorist murder of two U.S. Army soldiers outside a Little Rock recruiting station in 2009. Bledsoe converted to Islam in 2003 shortly after enrolling at Tennessee State University. Bledsoe later traveled to Yemen, where it is believed his radicalization continued. In contrast to what the ACLU states is the FBI's posture in its assessment, a chart on page four identifies a series of factors that may indicate a path toward radicalization among converts, and those factors mirror circumstances identified in the real world cases of radicalized American jihadists.